MECHANICSVILLE, Md. - Their rides were vastly different, but both Cory Maloney and Layton Sumpter walked away with big victories over the weekend at the International Hot Rod Association (IHRA) Summit Sportsman Spectacular event at Maryland International Raceway. Driving No Box door car, Maloney of Pasadena, Md., won Saturday's Moser Engineering Saturday $10,000-to-win top prize. On the other hand, Layton Sumpter of Silver Spring, Md., drove a Box dragster to the win in Sunday's $5,000-to-win race. Maloney drove a 1989 Ford Probe to a final-round win over Box racer Lindy Herman of Severn, Md., on Saturday. Maloney had a .007 reaction time and drove his 1989 Ford Probe to a 5.656 elapsed time at 120.84 mph. Herman had a bit slower start in his 2018 Swingarm dragster at .024 and finished his run in 4.718 seconds at 145.27 mph. Maloney also won the $1,000 No Box bonus with a win over Tony Mattera of Mechanicsville, Md., in the final. Maloney posted a 5.675-second run at 118.30 mph after a .029 reaction time. Mattera, who was slightly faster with a .026 start, ran a 6.600 elapsed time at 98.44 mph. 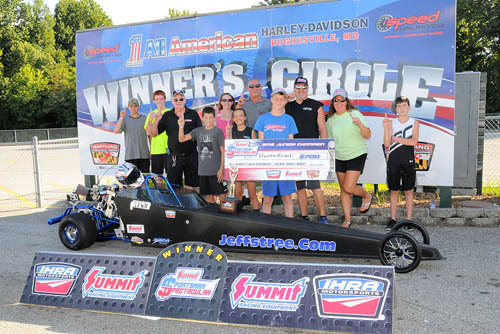 Hunter Groat of Hollywood, Md., won on a holeshot in Junior Dragster with a .020 reaction time to ..070 advantage over runner-up Tyler Sandy of Mechanicsville. Groat, won the $700 winner's purse and the $250 IHRA Summit SuperSeries bonus, with a 7.962-second pass at 80.12 mph. Sandy went down the track in 7.940 seconds at 80.56 mph. Patrick Estevez of White Plains, Md., won the $500 bonus as the final No Box racer on Sunday with a ..009 start and a run of 6.471 seconds at 102.65 mph. For a second straight day, a Mattera family member was the No Box runner-up. Bobby Mattera from Waldorf, Md., finished with a .032 reaction time and a pass of 5.724 seconds at 119.35 mph. Brooke Keyton from Severn, Md., took the Junior Dragster title when final-round opponent Zach Parlett from Charlotte Hall, Md., fouled at the start. Keyton captured the $700-to-win race with a ..095 reaction time and an 8.022-second elapsed time at 81.72 mph. Parlett's run down the track was in 9.031 seconds at 72.70 mph. The IHRA Summit Sportsman Spectacular takes the next few weeks off before returning to action Sept. 28-30 at Memphis International Raceway. Click here to pre-enter and register for two races for the price of one at Memphis or other races at Farmington (N.C.) Dragway and Darlington (S.C.) Dragway.